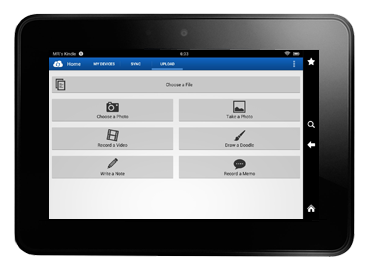 Kindle Fire Cloud Storage Released! Once again we’ve delivered yet another cloud storage app for our many customers benefiting from our acclaimed services which take data security, backup and accessibility to a whole new level. This new app, which is fresh from our developers’ office, will allow anyone with a Kindle Fire to be able to access and manage their cloud storage files from their device when on the move. Of course, this app will fit in nicely with our other successful apps currently on offer, such as our PC-based Windows and Mac software, and our mobile apps for iOS, BlackBerry, and Android-based devices too. You can learn more about our roster of apps on our Mobile Cloud Storage page. Remember, here at JustCloud we offer a whole range of Plans to suit your needs. Whether you're looking to manage data in the Home, your Business, or are looking to become a Cloud Storage Reseller, we've got it covered.